One of the movies getting a lot of buzz this year has been Darren Aronofsky’s Black Swan. The film is based on a thriller that zeros in on the relationship between a veteran ballet dancer and a rival. After seeing the trailer, I gotta say, I have no idea what the film is really about. Not really sure what to expect from the film, although it has been getting extremely positive reviews all around and is being called by some, Aronofsky’s finest work to date. Darren Aronofsky, who has directed such films as Requiem For a Dream and The Wrestler, moves towards a new direction and demonstrates the psychological toll the prusuit of perfection plays in our lives, and in this case a ballet dancer, played Natalie Portman. The film is said to have amazing performances from the entire cast including Mila Kunis as the rival and Vincent Cassel as the fiery director of the prodcution of White Swan, according to The Playlist. 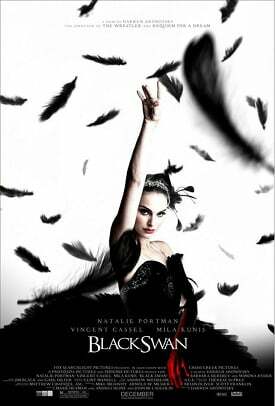 Just recently a brand new poster has been released featuring Natalie Portman’s character in a black ballet dress with black feathers floating around her. The film seems to be very intense based on the trailer and I personally cannot wait to see it. Be sure to check out Black Swan when it hits theatres on December 3, 2010.